He didn't ask to be a hero, but now all that stands between us and chaos... is Colt. He's forced to leave his old life behind and move to Arizona with his grandfather. The only person he knows at the new high school is a childhood friend named Dani. And Oz, a guy he's sure he's never met but who is strangely familiar. But what if his parents' death wasn't an accident? His mother, an investigative reporter, was going to expose a secret mind-control program run by one of the world's largest companies. Before she could release the story, what if agents from Trident Biotech made sure she couldn't go public? Vowing to uncover truth, Colt is drawn into a secret world of aliens, shapeshifters, flying motorcycles, and invisible getaways. The invasion has begun. 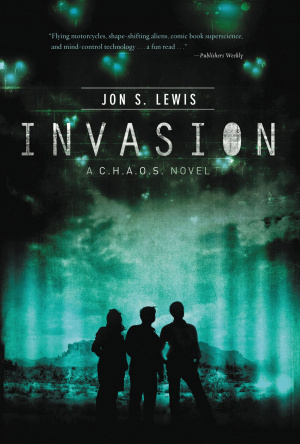 Invasion by Jon S. Lewis was published by Thomas Nelson in November 2011 and is our 11103rd best seller. The ISBN for Invasion is 9781401685423. Be the first to review Invasion! Got a question? No problem! Just click here to ask us about Invasion. Has this book any kind of christian content? A:This is a Christian Young Adult novel that depicts a battle between good and evil, and has an agency made to combat Occult and such forces. There is also a reference to a Bible study, a mention of a church service featuring King David and Uriah, and a character who mentions that Church attendance is important. Hope that helps. Thank you for using the Q&A Forum.